I love a good glam outfit at Christmas time. With the cold temps and short daylight hours, it's easy to get in the habit of nesting up in cozy pajamas all the time, but there's nothing quite like what a swipe of bold lipstick and a sparkly necklace can do for your mood. 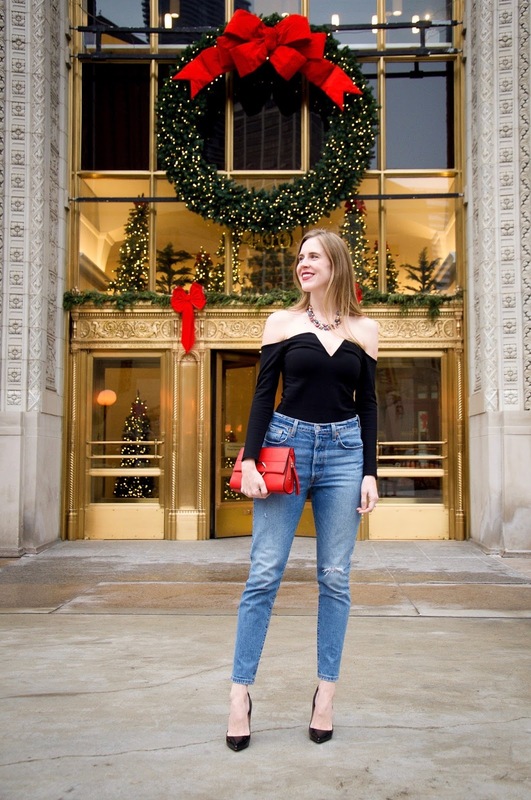 I came across this black off the shoulder top recently, and while my practical side said not to get it since I wouldn't be able to wear it to work, it ended up in my closet since I knew it would break the monotony of the oversized sweaters I'm wearing all the time. I feel instantly glam when I put it on, and that makes it all worth it!